I always the enjoy the opportunity to read posts about what others are reading so I hope this post falls into that camp for you. 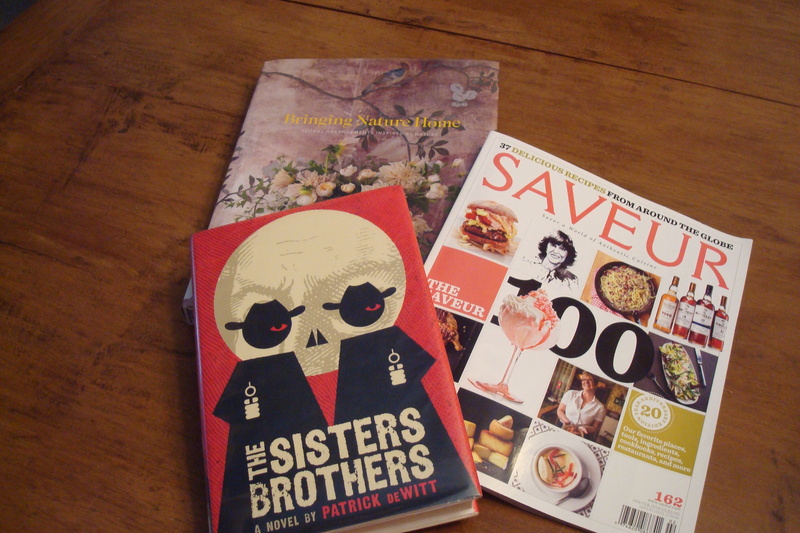 Before Christmas Break, I started The Sisters Brothers by Patrick DeWitt. My friend, Jacquelyn, recommended the book to me and I am glad I read it. The premise of the book may surprise you: two brothers, who are professional hit men, are hired to kill a man named Hermann Kermit Warm. The novel is set during the California Gold Rush. The book is both violent and poignant. Eli Sister, the narrator of the book, tells the story in a self-deprecating, straightforward style, which caught me off guard at times. As a reader, I entered his pain and desire to be known. DeWitt is also a good writer. Descriptions such as, “The creak of bed springs suffering under the weight of a restless man is as lonely a sound as I know,” caused me to reread certain passages and write them down because they were so good. Underneath the violence (Rest assured, this doesn’t dominate the story), is a story of wanting to be loved and known, and finding one’s place in the world. I interrupted my reading of The Sisters Brothers to read The Aviator’s Wife by Melanie Benjamin. The latter book was a newer release and I could only check it out for fourteen days. This is the story of Anne Morrow Lindbergh and her famous relationship with her husband, Charles. While reading this book, I had a discussion with Brad about the role of historical fiction, especially as it relates to real people. Since the book focuses so much on the relational aspect of the Lindberghs, the challenge as a reader is to hold in tension the conversations and thoughts of Anne as she describes their relationship. What is true and what is not? At the end of the book, Benjamin talks about the research she did for the book by compiling journal entries and letters written between Anne and Charles for the writing of the book. She certainly did her homework, but she admits that she added details and emotional responses based on her research. Just be careful as a reader that you don’t claim to know for certain what the Lindberghs’ personal lives and relationship was like. If you liked The Paris Wife by Paula McLain, you will like this book. Bringing Nature Home by Ngoe Minh Ngo is a feast for the eye. Just as the title suggests, the focus of this book is to encourage the reader to bring whatever is in season inside. This is the perfect coffee table book because you don’t want to read/look at it once, but many times. The photography is beautiful and the arrangements inspiring. At the end of the book, she even explains how to create lovely arrangements for the novice. I just finished reading the January/February 2014 Saveur issue, which is a yearly purchase for me. This issue focuses on the top 100 restaurants, chefs, kitchen tools, etc. from around the world. The number one entry from this issue is a diner located on the North Fork of Long Island, which boasts a lemon meringue pie that looked amazing in the picture. Once school lets out, it will be one of my first outings to celebrate the beginning of summer. There you have it—a peek onto my nightstand as of late. What’s on your nightstand? “The Lost Art of Listening,” by Michael Nichols and “the Water’s Lovely,” by Ruth Rendell. Also still savoring “Bread & Wine,” I like to make the recipes and read a chapter at a time-slowly.